It proposes adoption of the measures effective September 1. In two filings registered with the World Trade Organization on Tuesday, China signaled its intent to forbid 24 kinds of solid wastes by the end of 2017. China cited the objectives and rationales of “protection of human health or safety” and “protection of the environment” in filings. “By the end of 2017, China will forbid the import of 4 classes, 24 kinds of solid wastes, including plastics waste from living sources, vanadium slag, unsorted waste paper and waste textile materials,” according to one of the filings. China imports huge quantities of waste materials from the U.S. Overall, $5.6 billion in scrap commodities were exported from the United States to China last year, according to the Institute of Scrap Recycling Industries (ISRI). In addition China imports $1.9 billion in scrap paper (13.2 million tons) and $495 million in scrap plastics (or 1.42 million tons), according to ISRI. The waste and recycling industry in the U.S. was quick to react to the news. 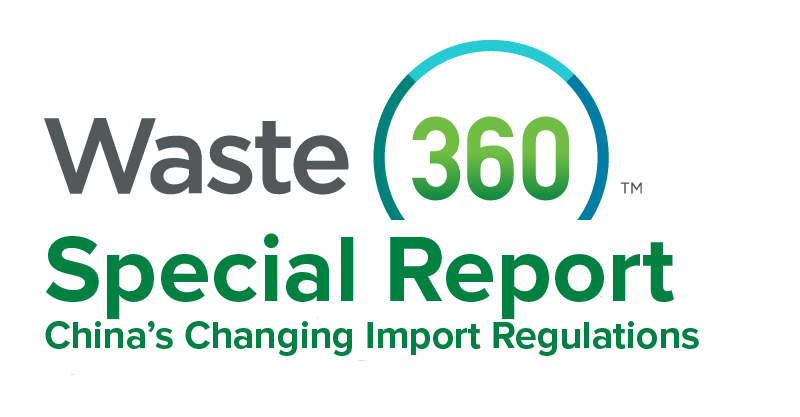 The ISRI also released a statement that it had already notified the Office of the United States Trade Representative and the U.S. Department of Commerce on the impact such a ban would have on the recycling industry. It also briefed U.S. officials in preparation for tomorrow’s U.S.-China Comprehensive Economic Dialogue (CED) in Washington. This is not the first time China has made moves to limit its imports of waste. In March, the China Scrap Plastics Association enacted “National Sword 2017” to crack down on plastic waste imports. It included heightened measures and inspections at China’s ports of waste coming in. More famously, in 2013 China erected its “Green Fence” to get tough on contamination in recycled commodity imports. In the first year of Operation Green Fence, almost 70 percent of all incoming containers loaded with recyclables were subjected to thorough inspections. This ultimately had the effect of U.S. recyclers producing higher quality materials to ship to China. Slag, dross (other than granulated slag), scalings and other waste from the manufacture of iron or steel. Ash and residues (other than from the manufacture of iron or steel), containing arsenic, metals or their compounds. Waste, parings and scrap, of plastics. Waste of wool or of fine or coarse animal hair, including yarn waste but excluding garnetted stock. Garnetted stock of wool or of fine or coarse animal hair. Cotton waste (including yarn waste and garnetted stock). Waste (including noils, yarn waste and garnetted stock) of man-made fibers. Used or new rags, scrap twine, cordage, rope and cables and worn out articles of twine, cordage, rope or cables, of textile materials.